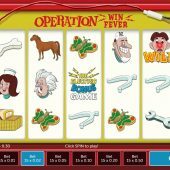 Operation Win Fever is another Hasbro board game-based slot for which Gamesys have the license. You may have seen their excellent Battleship Wild Targets game based on the 1980's 'Computer Battleships' game and if you are of that generation you will know these games used to be made by 'MB' until Hasbro took them over. Now I recall having the 'Operation' game as a child and even then found it dreadfully boring and pointless - you had a cartoon picture of a man on an operating table and little metal pockets to place or remove things like plastic bones and kidneys. For this you had metal tweezers on a wire and if you touched the pocket sides while performing these 'operations' you'd short-circuit and a buzzer would sound and a red light illuminate in the patient's nose. Stupendously exciting. So is this slot any more exciting than the original board game, only useful if you wanted the batteries for something else? 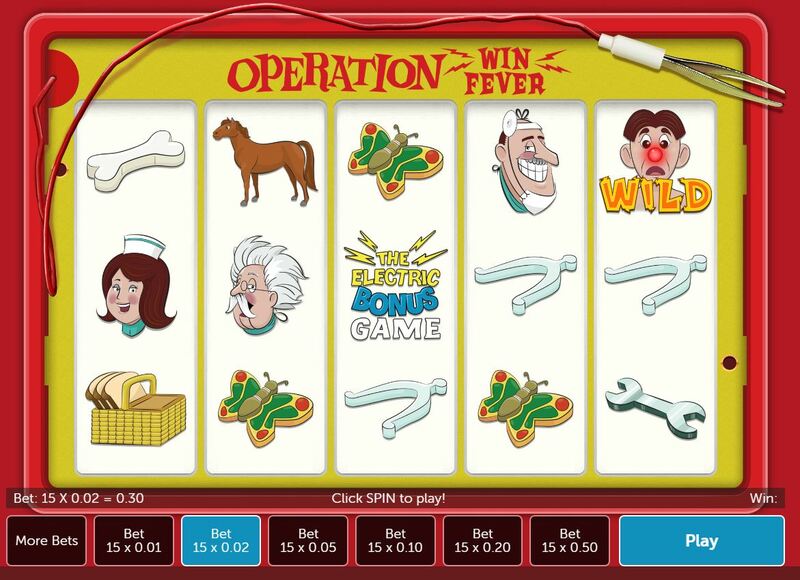 Operation Win Fever is a 15-line game on the standard 5x3 reels grid. You have the original icons from the game, such as the stirrup bone, femur bone, nurse, doctor, surgeon and for some reason a bread basket along with a horse and butterfly. The lower-paying ones can appear double-stacked. The Wild is the patient with the red flashing nose and it doesn't multiply but is found as a single icon on all reels - and you will get palpitations if you land 5-of-a-kind of them as they pay 200x stake! The doctor pays 67x bet for 5 and the lowest symbol is the femur bone at 6.7x bet. This indicates that the game is quite volatile because the 3 or 4-of-a-kind wins are quite low. Last 3 (10-12) all pay 8x. You will get 100x bet bonus if you successfully complete the 12 tasks before you use all your buzzer lives up. As you can see by the above table, you can only get a maximum of 46x bet before the round finishes, and this would total 146x bet with the 100x bonus for completing all the tasks.